I for one used to eat it. When I was about five may be. Minuscule amount that would fit between the thumb and forefinger of a five year old kid. But yeah, I used to eat it. Or may be all of us did that at some point. And chalk too. From classrooms at school. Eat chalk. Same thing, another form. And then I grew up. I consume it differently now. I see bits of it in that slant ray of light coming into my room from the window. Looks like the particles are people, cars, traffic, aimlessly moving on a downhill road with no surface underneath. A multi – planar road. I play it on my hands when preparing a pot for a plant. I just cant help but squeeze it in my fists. To see it appear coyly out of the gaps between my fingers and thumb. I feel it under my feet, very seldom these days though. So reassuring. I guess that’s why we stand on it with bare feet to ground ourselves. It absorbs everything we give to it that we dont want. 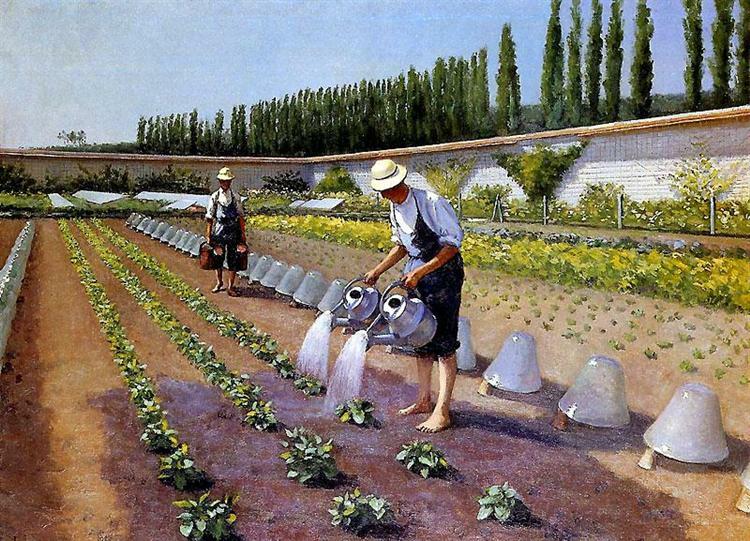 The painting ‘The Gardeners’ by Gustave Caillebotte. I particularly look at the damp soil underneath the bare feet of the gardener watering the plants. Look at it for a few seconds, and may be you will feel the same cool, reassuring feeling of grounding. I took a handful of moist clay one day, wrapped it up in linen, and just played with it. 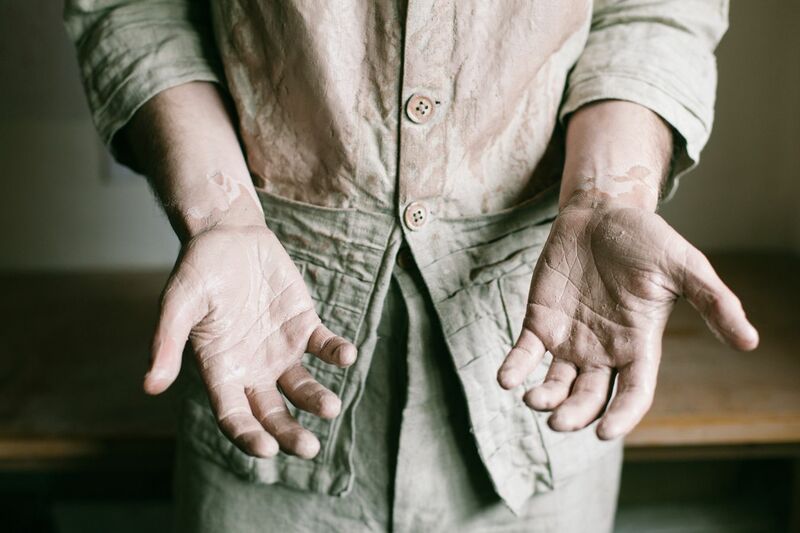 The threads, my hands, and the clay became the three corners of a triangle. The three characters in a scene on stage. Improvisation ruled. I could see they enjoyed the process. All became one for a few moments. And then I peeled the linen off. The threads left an imprint as a goodbye note on the surface. It is so much like us. Begins with no shape or form or definition. The start is the end is the start. It grounds us all, yet isnt attached. Holds no enmity. Just like children. Have it in your hands, and it is all yours. Infuse with water, glances of the fingertips here and there – and it breathes. Takes shape. Bring it face to face with fire, it hardens. Character. No more maleable. A little innocence lost may be. But it lives a little. And then, surrenders to gravity one day. Breaks. Pieces. With no pre-concieved notions. Or even concieved ones. The end is the start is the end. Ends with no shape or form or definition. It is so much like us.